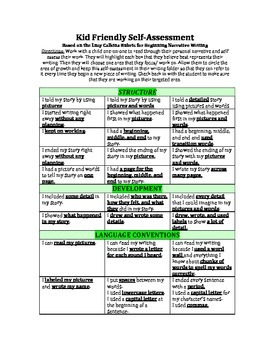 This "Kid Friendly Self-­Assessment" is based on the Lucy Calkins Rubric for beginning narrative writing. Directions on How to use this rubric: This rubric works best if it is introduced to each child one-on-one. They will read through their personal narrative and begin to self assess their work with your guidance. They will highlight each box that they feel best represents their writing. Then they will choose one area that they need improvement in or want to focus on. It would be useful to allow them to circle the area of growth and keep this self assessment in their writing folder so that they can refer to it every time they begin a new piece of writing or so that you can use it when you are conferencing with them. Make sure that you check back with the student to ensure that they are working on their targeted area.